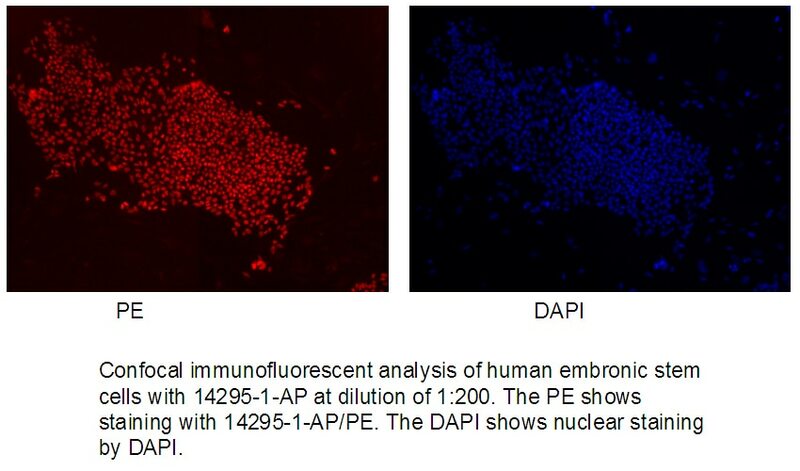 Confocal immunofluorescent analysis of human embronic stem cells with 14295-1-AP at dilution of 1:200. The PE shows staining with 14295-1-AP/PE. The DAPI shows nuclear staining by DAPI. Curcumin Suppresses Lung Cancer Stem Cells via Inhibiting Wnt/β-catenin and Sonic Hedgehog Pathways. Generation and characterization of induced pluripotent stem cells from guinea pig fetal fibroblasts. miR-19 targeting of GSK3β mediates sulforaphane suppression of lung cancer stem cells.